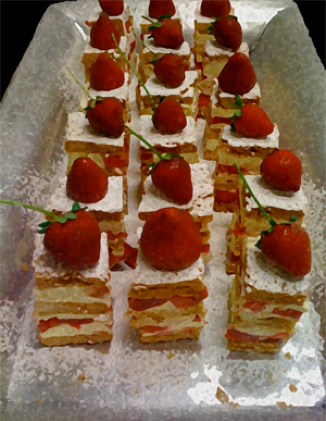 Napoleon, that pastry from the Parthenon of French creations comes alive in many recreations. 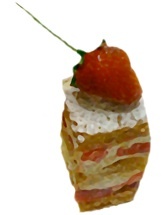 Some contain layers of cake or mousse or even fruits. We love to stray from the conservative and classic and this can be seen in the creations being sold at pastry shops for the last few years. I first made this creation for a CHN event in SF in late spring. Strawberries and rhubarb had just shown up at the farmers market and were both small and tart. I wanted to create a Napoleon with a layer of Strawberry Rhubarb gelee and layers of white chocolate mousseline cream and inverted puff pastry. This project is based on one sheet of puff pastry. Bloom the gelatin in cold water in the fridge. Slice the strawberries and rhubarb. Cook the rhubarb in the sugar with the scraped vanilla pod over a medium heat and then add ¾ of the strawberries. Once this mixture is tender, add the remainder of the strawberries and then add the bloomed, drained gelatin. Stir until gelatin is completely dissolved and dispersed. Cool mixture to 100 degrees F and then deposit into a mold 1/3rd the width of the puff pastry and the full length of puff pastry sheet. With all the ingredients except for the white chocolate and butter, make a pastry cream*. Once cooked, add ½ the softened butter and the white chocolate to the cream and mix until incorporated. Deposit onto a plastic lined sheet pan, cover to the surface and then refrigerate the cream for 30 minutes. After the cream is cool deposit the cream in a mixer and whip the chilled cream and add the other 1/2 of the softened butter. Mix the cream for 5 minutes, or until it becomes light and fluffy. Combine the cornstarch and sugar in a bowl, and whisk the yolks into the sugar/cornstarch mixture just until combined. Temper the milk into the yolk mixture, and return this mixture back to the pot, stirring constantly. Continue to cook the custard while stirring until it has boiled for two minutes. Trim the edges of the puff dough sheet to square it off. Cut the sheet into 3 strips lengthwise, about 13 cm/5 inches wide each. Apply 1/2 the cream to the bottom strip and spread evenly. Top this layer of cream with the frozen layer of strawberry rhubarb compote. Next, apply the second strip of puff pastry onto the compote. Apply the next layer of the cream and place the last strip of puff pastry on the assembly and place it in the freezer to firm the cream before cutting. Cut into slices or squares for small or large cakes and garnish with powdered sugar and fresh strawberries.